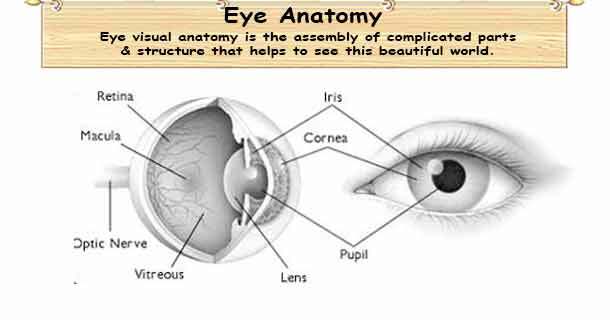 Eye visual anatomy is the assembly of complicated parts and structure that helps to see this beautiful world. What we are seeing is the result of a series of events that occur between the eye, the brain, and the outside world. Eyeballs - Eye is a small ball that sits in a little hollow area called the eye socket in the skull. Conjunctiva - is a mucous membrane that lines the eyelids and covers the front part of the eyeball. Eyelid - protects the eye helps keep the eye clean and moist by opening and closing several times a minute called blinking. It happens both as a voluntary (with our knowledge) and involuntary (without our knowledge). If you bring your finger in front of the friend’s eye, the eyelid shot off, that is it helps to product from possible danger. Sclera - white part of the eyeball, made of tough material covering most part of the eyeball. There are tiny pink threads, which are blood vessels that supply blood to the sclera. Aqueous Humor - is a clear, watery fluid that fills the front part of the eye between the cornea, lens, and iris. Cornea - the transparent dome in front of the eye, it transmits and focuses light into the eye. It looks like a clear glass window to view the world through. Iris - the colored part of the eye helps to regulate the amount of light that enters the eye. When a person has blue eyes, it really means that person has blue iris! Pupil - is the dark center in the middle of the iris, which changes size in response to amount of illumination to control the amount of light that is allowing into the eye. Anterior chamber - space between the cornea and the iris, filled with a special transparent fluid that nourishes the eye and keeps it healthy. Lens – is the transparent structure behind the iris that helps to focus light rays onto the retina. Choroid - is the middle layer of the eyeball, which contains veins and arteries that nourish the eye, especially the retina. Retina - is the nerve layer that lines the back of the eye, senses’ light, and creates nerve impulses that are sending through the optic nerve to the brain. Retina is comparable to the filming screen in a cinema hall. Macula - is a small area in the retina with special light sensitive cells. It helps to see fine details clearly. Fovea - A tiny area located in the macula that is the area of the clearest vision on the retina. Optic nerve - is the nerve that connects the eye to the brain, which carries the impulses formed by the retina to the brain, where it interprets as images. Ciliary muscle - lens is suspending in a bunch of fibers, fibers in-turn attached to a muscle called ciliary muscle. It helps to change the shape of the lens to see & focus far and closer thing. Vitreous - is the clear, jelly-like substance that fills the middle of the eye. Rod & cones – retina has and uses 120 million rods and 7 million cones of special cells in each eye to process the light. Rod’s senses black, white, and shades of gray. They are very sensitive, allows seeing even in the dark. Cones senses colors and need bright light than rods to perform well. Visual information from the retina transported from the eye to the brain via the optic nerve. Because both eyes see from slightly different positions, the brain can mix the two images in such a way to receive a complete clear picture.